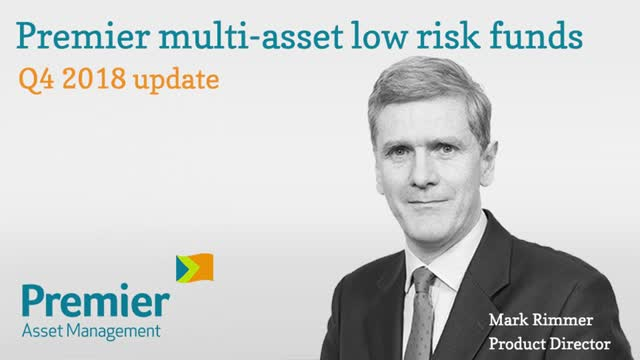 Mark Rimmer, Product Director of Premier Multi-Asset Funds, provides a quarterly update on Premier's multi-asset low risk funds, discussing performance, portfolio activity and his investment outlook for 2019. Mark Rimmer, Product Director of Premier Multi-Asset Funds, provides a quarterly update on Premier's multi-asset growth funds, discussing performance, portfolio activity and his investment outlook for 2019. Mark Rimmer, Product Director of Premier Multi-Asset Funds, provides a quarterly update on Premier's multi-asset income funds, discussing performance, portfolio activity and his investment outlook for 2019. David Thornton, Senior Investment Manager, Premier multi-asset funds, discusses fund performance, asset allocation changes, trading activity and Distribution Technology's recent benchmark asset allocation changes. Premier's chief investment officer and manager of the Premier Diversified and Diversified Income funds, Neil Birrell, provides a performance update, discusses recent portfolio activity and shares his long-term outlook for dividends. Neil Birrell, Chief Investment Officer at Premier Asset Management, discusses his views on why 2018 began with such optimism but ended on pessimism and what this could mean for markets in 2019. Chris White and Geoff Kirk, co-managers of the Premier Optimum Income Fund, discuss performance, asset allocation and how much of the portfolio was overwritten over Q3 2018. They also provide an outlook for UK dividends. Chris White and Geoff Kirk, co-managers of the Premier Optimum Income Fund, discuss the 7% p.a. target yield, investible universe of UK equities and the risks and benefits associated with using a covered call option strategy. Mark Rimmer, Product Director, Premier multi-asset funds, discusses how the funds performed during Q3, income sustainability, asset allocation changes, trading activity and he also provides an outlook for equity markets. David Thornton, Senior Investment Manager, Premier multi-asset funds, discusses how the funds performed during Q3, asset allocation changes, trading activity and how Distribution Technology's benchmark asset allocation changes will impact the funds. Mark Rimmer, Product Director, Premier multi-asset funds, discusses how the funds performed during Q3, asset allocation changes, trading activity and he also provides an outlook for equity markets. Premier's chief investment officer and manager of the Premier Diversified and Diversified Income funds, Neil Birrell, provides an update on what has happened to global markets since the start of Q4. Premier's chief investment officer and manager of the Premier Diversified and Diversified Income funds, Neil Birrell, provides a Q3 update. Mark Rimmer, Product Director, Multi-Asset Funds, provides an overview for the Premier multi-asset low risk funds. He explains how the funds are structured, who is responsible for managing the funds, how the asset allocation differs between the two funds and how the multi-asset team identifies best in class fund managers. Mark Rimmer, Product Director, Multi-Asset Funds, provides an overview for the Premier multi-asset growth funds. He explains how the funds are structured, who is responsible for managing the funds, how the asset allocation differs between the two funds and how the multi-asset team identifies best in class fund managers. Mark Rimmer, Product Director, Multi-Asset Funds, provides an overview for the Premier multi-asset income funds. He explains how the funds are structured, who is responsible for managing the funds, how the asset allocation differs between the two funds and how the multi-asset team identifies best in class fund managers. Alex discusses current fund positioning, the appeal of the German residential market, Brexit and the impact of interest rate rises on the sector. Alex Ross explains his investment process for delivering income and long-term growth from a focused portfolio of European property company shares. In this update, David Thornton, Senior Investment Manager, Multi-Asset Funds, explains why the funds’ bond exposure is very different to a traditional bond portfolio, why the funds are underweight the US but overweight emerging markets and he also shares his views on markets, covering both opportunities and threats. Premier Asset Management webinars are designed to provide investment professionals with the latest information about Premier’s range of funds, together with our views on major economic themes and market trends.